Hans Tan is a designer and an educator based in Singapore. His work tiptoes on the boundaries between design, craft and art. He believes that design not only helps us “do”, design also helps us “understand” – his practice deploys design as medium, making use of utility as a pretext for visual discourse, while maintaining a keen focus in developing materials and processes. The embedded narratives in his works comment on design and its industry as a phenomenon, especially in the context of heritage, consumption and waste. In 2009, Hans was spotted by Designnet magazine Korea as one of 36 Young Asian Designers, and was a winner of the Martell Rising Personalities Award 2009 which honours individuals from different creative fields who are passionately driven to push beyond the boundaries of success. He was awarded with the distinction of “Les Découvertes” (best innovative product) at the fall edition of Maison et Objet 2012 in Paris, and he is a two-time winner of Design of the Year at the President's Design Award, Singapore's highest design accolade. In 2018, Hans was honoured with the Designer of the Year at the President's Design Award 2017/18, Singapore’s highest recognition for a designer, for the impact of his body of work and his contributions to the design community through education. Hans’ works have been shown in exhibitions such as “Singletown” at the Venice Biennale, “Surface art/design” in Dortmund and Cologne, “No Boundaries” at ArtStage Singapore, and “Beauty” at the Cooper Hewitt Design Triennial, Smithsonian Design Museum New York, “Shifting Objectives” at M+ Museum, Hong Kong, and “Local Icons East/West” at MAXXI Museo, Rome. His works are held in private and corporate collections, as well as public permanent collections at the National Collection of Singapore; M+ Museum for Visual Culture, Hong Kong; the Cooper Hewitt Smithsonian Design Museum, New York, and the Princessehof National Museum of Ceramics Leeuwarden, Netherlands. Hans has also actively engaged in curatorial work, and has produced several exhibitions with a keen interest in the discursive capacity of design to engage public perceptions. His penchant for design pedagogy is guided by the concept of deformative inquiry, and has developed imaginative thinking tools that provide novel approaches to the design process based on generative deformations, use of language and systematic reflection. 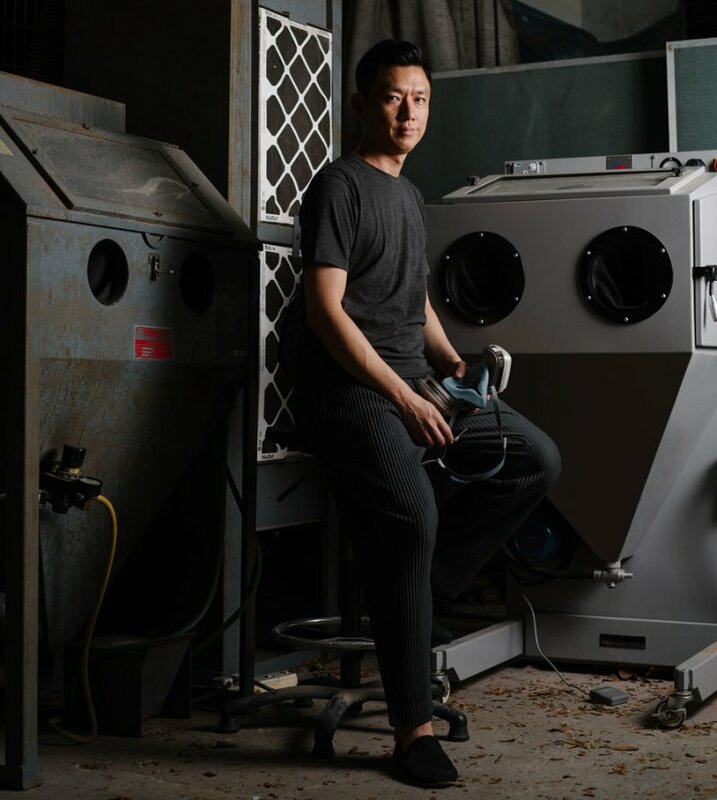 He is an assistant professor at the Division of Industrial Design, National University of Singapore, where he has received multiple teaching awards at both faculty and university level. 2018.06 In Search of Southeast Asia through the M+ Collections, Hong Kong. 2018.06 Made in Holland 400 jaar wereldmerk, Netherlands. 2018.01 The Artling Collectible Design Showcase, Singapore. 2017.10 ITB Asia, Singapore Tourism Board, Marina Bay Sands. 2017.10 Peranakan Gallery, Peranakan Museum, Changi Airport T4. 2017.09 Porcelain and Craft Festival, Supermama, Gillman Barracks. 2017.06 ACM SIGCHI Creativity and Cognition Exhibition, Singapore. 2017.05 SCCC “Creativity in Pulses” Exhibition, Singapore. 2017.03 Tomorrow: Design Sories of our Future, Singaplural. 2016.12 Shifting Objectives, M+ Museum, Hong Kong. 2016.10 Beauty, San Jose Museum or Art , San Jose. 2016.09 Porcelain Festival, Supermama @ Gillman Barracks, Singapore. 2016.03 PDA 2006-2015: A Decade of Design Excellence, Singapre. 2016.02 Beauty, Cooper Hewitt, Smithsonian Design Museum, New York. 2016.02 Local Icons East/West. MAXXI Museo, Rome. 2016.01 The Alchemist, Singapore Art Museum. 2015.07 Singapore Souvenirs 2015, National Design Centre. 2015.04 The Alchemist, Milan Design Week. 2015.05 Rising Asian Stars, Creative Taiwan Expo. 2015.04 Bank of Kinectic, Singapore Inside Out, Beijing, London, New York. 2014.11 “Go MAD”, Mad Museum of Art & Design, Singapore. 2014.09 Asia Talents 10 Eco Designers 2014, Bangkok. 2014.12 Industy+, Singapore Design Centre. 2013.03 Bench, Dhoby Ghaut Green (Singaplural) and URA Centre, Singapore. 2013.01 Closure, Block 8 Teban Gardens, Singapore. 2012.11 Creative Cultures: The Singapore Showcase, DesignTide Tokyo. 2012.03 30 Chairs Lifestories, Singaplural Design Week, Singapore. 2011.09 Maison&Objet, fall edition, Paris. 2011.05 INTER_PLAY, ChanHampe Galleries, Singapore. 2011.01 No Boundaries, ArtStage, Singapore 2010. 2010.12 Focus on Singapore, M.U.H. Gallery, LINEART Art Fair, Ghent. 2010.07 Help Save Paper, Iluma Singapore / Airport Tempelhof Berlin. 2010.08 Rest & Relax, Singapore Changi Airport. 2009.11 V for Vase, Singapore Design Festival 2009. 2009.11 Singapore Souvenirs, Singapore Design Festival 2009. 2009.11 Useless Gallery Exhibition, Singapore Design Festival 2009. 2009.09 ’t BUURTHUIS, KOP, Breda. 2009.07 On Arrangement, The Substation Gallery, Singapore. 2009.02 SURFACE art/design, WestfalenForum, Dortmund. 2009.01 SURFACE art/design, Rheintriadem, Köln. 2008.10 SINGLETOWN, 11th Architectural Biennale, Venice. 2008.10 STILL - Design Academy Eindhoven, Design September, Brussels. 2008.04 STILL - Design Academy Eindhoven, Salone del Mobile 2008, Milan. 2007.11 Hark! Singapore Design Festival 2007. 2007.07 Master Pieces 2007, Droog Gallery, Amsterdam. 2006.10 Lingering Artefacts, Dutch Design Week 2006, Eindhoven. 2006.03 Hatch, Milan Salone Satellite 2006, Milan. 2005.04 Furniture Design Award 2005 Finalists Showcase, Singapore Esplanade. 2005.03 Singapore Evening (work featured in multimedia presentation), London. 2005.03 International Furniture Fair Singapore 2005, Singapore Expo. 2004.10 Tokyo Designers Block 2004, Japan. If you’d like to do an internship at the studio of Hans Tan you are very welcome to apply. Please write an email with your portfolio and period of availability.